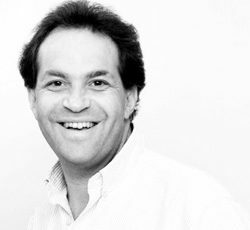 Nigel Risner is quickly becoming one of the most sought after keynote speakers in the world and has been thrilling, changing and shaping audiences for numerous years. Nigel’s unique ability to translate serious and powerful messages into incredibly entertaining and empowering experiences has repeatedly captured and inspired his audiences. Nigel is a respected author, television presenter and gifted speaker, and is the only motivational speaker in Europe to have been awarded Speaker of the Year from both The Academy for Chief Executives and Vistage (formerly known as The Executive Committee). With his own life having occasionally deviated severely from comfortable norms, Nigel is able to speak with authority. He has learned the hard way that positive results can come from negative experiences, and that the best lessons are often learned from situations that are unfamiliar and even uncomfortable. As one of the youngest CEO’s of a financial services company in London, Nigel knows what it takes to lead a successful business. He has the ability to translate a hands-on experience into a coherent, compelling and exciting philosophy, which has made him one of Europe’s leading keynote speakers, and a powerful and professional one-to-one coach to some of the world’s leading business executives. Nigel is an accomplished author with many successful self-help books, CD collections and instructional guides to his credit. His books You had me at Hello, which concerns the new rules for better networking, and It’s a zoo around here, includes the new rules for better communication, have both sold thousands of copies and are literally transforming lives all around the world. His latest book The IMPACT Code has been proved to be effective, and is thus setting a new standard for self-help guides. Today, Nigel conducts more than 150 motivational seminars and corporate speaking engagements a year for an enormous variety of companies and organisations in Britain and overseas. When he isn’t travelling, Nigel lives with his wife and two children in Hertfordshire. He continues to appear on prime time chat shows, such as “Richard & Judy” and makes many radio appearances all around the world. Nigel delivers information “with a lot of snap” – so people can grasp it then, remember it now, and use it at once. He has a knack for entertaining up a storm while carefully laying down a simple, powerful, business-building message – a message that people remember for a long, long time. His basic point is one of empowerment: Think bigger, he urges, figure out ‘what needs to be done’ beyond the confines of your job description and do it!